Price is .35 each, sold in bags of 100 pieces. PLEASE NOTE THAT THIS PRODUCT IS NOT FOR INDIVIDUAL SALE! The suede bags are sold only in conjunction with any of our BULK MINERAL products. 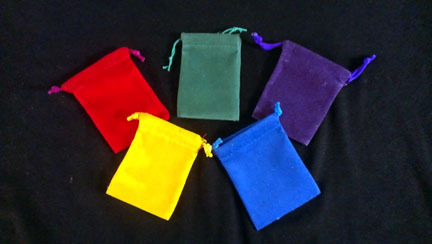 Suede Drawstring Bag 2" x 3". Great for holding your customers' treasures! This 2" x 3" bag is available in assorted only. Vibrant colors include: yellow, blue, bright red, purple, and green. ORDER BY 100 PIECE BAGS. Perfect for filling with our Bulk Gem Mix or other bulk items!! Pikes Peak Rock Shop Catalog - This store is powered by ShopSite web catalog software.